Performance Time: Approximately 45-60 mins, 47 pgs. COLLECTION/FARCE. 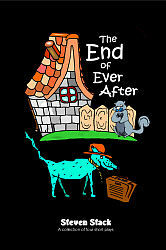 The marvelously madcap characters in this collection of four short plays may have reached the end of their happily ever after! In “The Ravens,” a melancholy girl is visited on a stormy night by three annoying ravens, who she hopes will never darken her doorstep again. In “The Break-Up,” Dylan discovers his girlfriend is actually in love with his identical twin brother. In “The Golden Arm Returns…to Whom it Originally Belonged,” a ghost helps Jamie and Sal find true love in a spiritual kind of way. And in “Home Insurance,” a vegetarian wolf who sells home insurance meets Little Red Riding Hood in the forest and ends up at Grandma’s house hoping to end his sales slump.